Victoria's box-ironbark forests are magic. Whatever time of year you visit, their beauty is evident. The rugged, gnarled trunks of the ironbarks stand black as if they’ve clung to their night-time colour scheme despite the breaking of day. Up close, the black bark is crisscrossed by deep fissures, forming a net whose depths are the colour of rich amber and give the sense that the trees are bursting with warmth. The other eucalypts are more demure. From the pale grey, elephant skin-like bark of the Grey Box to the shaggy mess of bark cloaking a Red Stringybark, each adds its own immutable stamp on the box-ironbark forest identity. Above, the foliage hangs grey-green as if a thick mist has descended on the forest. The calls of woodland birds ring out, and, at certain times of the year, the forest floor and understory is awash with floral splendour. There is no choice but to be spellbound. When gold was found in central Victoria in the middle of the 1800s, miners soon flocked to box-ironbark country. They, like me, quickly saw how special these forests are. However, the value they saw was in the versatility of the timber. It made for ideal stays to bolster mine shafts deep underground; it was perfectly suited for use as railway sleepers in the burgeoning rail network freighting gold across the state. And, as hinted by the warm colour in the fissures of the bark, it burned with a long and lovely heat in campfires and cooking stoves. The rapidly growing population also increased demand for food and many of the grassy box-ironbark woodlands on fertile soils were soon replaced by agricultural enterprises to supply this demand. In the years that followed the discovery of gold, mining boomed and the magnificent box-ironbark forests were felled. I started this article by spruiking the magic of today's box-ironbark forests, and they are indeed magical. The box-ironbark forests we are fortunate to have today rekindled themselves from ruin like a magical phoenix rising from the ashes - a small, irrevocably damaged phoenix. When the gold rush began to ebb, disused mine sites began to regain their tree cover. However, box-ironbark forests never returned to their full extent. In fact, only 17% of their former area is forest today. Unlike the gold mining boom, agriculture and settlements have relinquished little of their hold over box-ironbark country with the passing of time. In parallel with the huge reduction in forest, a quick walk through one of Victoria’s box-ironbark forests today reveals other, more subtle legacies left by the gold rush. Most of the trees now standing have regrown from the base of the cut stump of their predecessor, and this regrowth has resulted in a forest made up of trees with multiple, thin stems. Gone are the immense forest giants of previous centuries, and their loss has seen the depletion of many habitat features relied upon by the wildlife that calls these forests home. Tree hollows used by large birds and arboreal mammals are now scarce, and nectar – a key food source for many birds in these forests – formerly produced in copious quantities by the forest giants is now supplied in inferior volumes by their multi-stemmed counterparts. Furthermore, the larger trees would have produced more and larger fallen timber than today’s smaller trees, and thus species that use fallen timber for den sites (e.g. the Yellow-footed Antechinus) and foraging (e.g. the Hooded Robin) likely suffer as a result. As time passes, it is possible to see the slow succession as the forest crawls towards its former glory. Tree stems growing from the base of a dead and decaying stump are often weak, and it is not uncommon to see one or more stems of a multi-stemmed tree lying on the forest floor, having split from the stump. Similarly, the dead stump lacks bark, which usually provides the tree with a protective shield from fire. Fire in a box-ironbark forest, even a low intensity fuel reduction burn, will often result in many multi-stemmed trees collapsing because they are burnt out from the base once fire enters the exposed stump. And so, as the number of stems slowly decreases, the growth rate of those that remain increases because they no longer experience as much competition for resources, such as light, nutrients and water. The transition of our box-ironbark forests to their original state is glacially slow, but I am hopeful that one day these forests will once again be dominated by trees of a behemoth size. If you were to take a large diamond and hit it with an even larger hammer until the diamond shattered into many tiny fragments, would you then throw the diamond fragments away? Of course you wouldn’t; they’re still diamonds after all! Victoria’s box-ironbark forests have been shattered by the hammer of the gold rush and agriculture, but they remain incredibly valuable. Their worth cannot be understated for declining species such as the Squirrel Glider, Woodland Blind Snake and Regent Honeyeater, for which box-ironbark forests represent their core habitat. Far from diminishing the magic of box-ironbark forests, their history of degradation in the last two centuries and the resilience they have shown is even more reason to celebrate them. Rowan is a Monash University PhD graduate and now works there as an ecologist. His research interests are broad, spanning seabird foraging ecology to plant invasions. When not in his office, he will most likely be in a woodland with binoculars around his neck and camera in hand. This is a guest article by Jacinta Humphrey. Standing amongst the ancient River Red Gums of the La Trobe Wildlife Sanctuary, it’s hard to visualise the landscape as cleared grazing pasture. The nearby wetlands buzz with activity as waterbirds forage for invertebrates and frogs call out to prospective mates. Surely this scene has remained constant for centuries, just like the towering gum trees above? But these eucalypt sentinels have witnessed more change than you can imagine. The area now known as the La Trobe Wildlife Sanctuary has experienced a dramatic transformation over the years. Located at the La Trobe University campus in Bundoora, the Sanctuary is one of the longest running ecological restoration projects in Australia. The 29-hectare reserve is a haven for indigenous biota, in a highly urbanised and densely populated landscape. In August this year, the La Trobe Wildlife Sanctuary commemorated a golden milestone: their 50th anniversary. The Sanctuary is situated on the traditional land of the Kurnaj-berring tribe of the Wurundjeri people. Evidence of Indigenous occupation can be seen throughout the reserve, including native food sources, stone artefacts, and scars on the bark of eucalypt trees. Early European settlers first arrived in the Bundoora area in 1835 and began clearing native vegetation to make way for stock grazing. This grazing resulted in large scale habitat degradation and the local extinction of several indigenous species. In 1912, the Mont Park Psychiatric Hospital was established in Bundoora, its grounds encompassing the site of the modern-day Wildlife Sanctuary. A large number of exotic trees were introduced to the area for ornamental gardens as well as grains, vegetables and fruit to provide food for the hospital. Many of the hospital’s patients were returned servicemen who had served in World War I and later World War II. These patients were encouraged to take part in recreational activities, resulting in the development of a football oval and two adjacent tennis courts on site. In 1965, the Psychiatric Hospital was closed and the land was sold off for a new education institution: La Trobe University. Two years later in August 1967, a meeting was held to discuss the future of development on campus. From this meeting, the La Trobe University Conservation Society was born; a union of staff and students with a vision to create a haven for Australian wildlife. A small parcel of land (only 6.5 hectares) was set aside as a new conservation area, forming the La Trobe Wildlife Sanctuary. Over the last 50 years, this parcel of land has grown to encompass just under 30 hectares of native vegetation. Through the practice of ecological restoration, with the help of hundreds of dedicated staff and volunteers, the La Trobe Wildlife Sanctuary has recreated a network of wetland habitats, replanted indigenous vegetation, and reintroduced threatened species. During this process, they have eradicated exotic weeds, removed invasive predators and erected a 2.2 km predator-proof fence to stop the movement of introduced species and protect native inhabitants. This extensive work has re-established natural ecosystem processes such as freshwater filtration, and successfully restored a degraded grazing paddock to a healthy grassy woodland habitat. Today, the La Trobe Wildlife Sanctuary land is legally protected under a Trust for Nature Conservation Covenant. This agreement ensures that all native vegetation within the Sanctuary will be protected for future generations. The Sanctuary now functions as La Trobe University’s ‘Outdoor Laboratory’, fostering environmental education, research and sustainability, while achieving conservation of indigenous flora and fauna. It is home to a wide variety of Australian native birds, marsupials, frogs, turtles, aquatic invertebrates and plant species. With the completion of the predator-proof fence, the Sanctuary may now play a new role in the conservation of Australian biota. Fox-free reserves are highly valuable for the reintroduction of threatened species, particularly small native mammals. The recently completed fence will allow the Sanctuary to plan for future reintroductions and thereby continue the restoration of the landscape back to its pre-European condition. 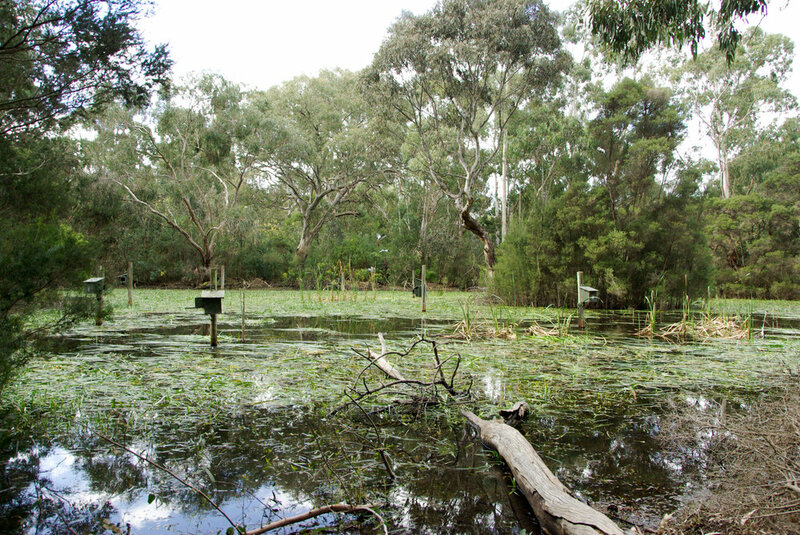 The La Trobe Wildlife Sanctuary welcomes visitors anytime between 10am – 3pm from Sunday to Friday. Take a walk back in time beneath the ancient River Red Gums today. Jacinta Humphrey is a PhD Candidate at La Trobe University interested in the effects of urbanisation on native wildlife. She also works part-time at the La Trobe Wildlife Sanctuary in Community Education. You can find her on Twitter at @HumphreyJE_. Banner image of an Eastern Grey Kangaroo courtesy of Andrew Stocker (La Trobe Wildlife Sanctuary). ‘Zoo’. Oops, did I just say a bad word? Zoos are places of captivity, four walls (sometimes a roof) and metal bars, right? No animal should ever live there. Or, are they a refuge, a place for rehabilitation, research and conservation? Perhaps an animal (or species in general) could benefit from a zoo? Jenny Gray’s book Zoo Ethics: The Challenges of Compassionate Conservation asks us to question our conventional understanding of zoos (well-run zoos, that is! ), highlighting not just the conservation efforts they undertake, but also our own philosophies as to how and why we should care for an animal’s mental and physical wellbeing as we would our own. Gray begins by tracing the history of zoos, detailing the shift from the private menageries of the rich and powerful of antiquity, the public gardens of the late 1700s filled with exotic creatures (hence ‘zoological gardens’ i.e. ‘zoo’) and finally, to the modern-day zoos that feature in many of the world’s major cities. One constant has remained, however: the lingering, almost instinctive imagery of imprisonment that comes to mind when people hear the word ‘zoo’. Unfortunately, it is this bias which can influence people’s understanding of what a modern-day zoo is and how it functions. Being careful not to paint all zoos with the same brush, Gray clearly defines what a modern-day, well-run zoo looks like compared to those which are severely under-resourced and poorly managed. By taking your hand, walking you through the history of zoos and the evolution of our philosophies regarding animal rights and welfare, Gray is able to relieve you of any preconceived notions of what a zoo is or might be, and opens your mind to the ethical considerations and dilemmas zoos must face. Fully aware of what a modern zoo is and how it functions, Gray prepares you for what constitutes the bulk of the book. Throughout the next few chapters, the reader is introduced to a variety of ethical philosophies central to defining a well-run and compassionate zoo. Although philosophy can seem daunting, Gray cleverly builds up this section in complexity, allowing you first to understand the basic principles of animal welfare and rights through concepts like the Five Freedoms (freedom from hunger or thirst, freedom from discomfort, freedom from pain, injury or disease, freedom to express natural behaviours, freedom from fear or distress). The real crux of the book delves (not too deeply but quite succinctly) into the complexities around ethical behaviour in general, in particular consequentialism (how the value or righteousness of an act is judged by its outcome), virtue theory (largely concerned with the character of people - are we creating ‘better’ people? ), and environmental ethics (understanding that nature’s value isn’t limited by its value to humans and that all life is central to the value of nature). Gray presents a well-measured balance of rational arguments when addressing each of these ethical philosophies in the context of zoos, their operations, and conservation in general. Credit is freely given where due and in cases where Gray disagrees, arguments are confidently and soundly rebutted. To this end, Gray is able to gently place you well inside the camp of ‘zoos can really be a modern-day ark’. Importantly, by this stage, you are well on your way to understanding the basics of key ethical philosophies which empower you to make your own, well-informed decisions. Damned if you do, damned if you don’t. This is what a ‘wicked problem’ is – problems where solutions don’t come easily, are neither right nor wrong, and often result in some form of negative consequence. Many of us remember the case of Harambe, the gorilla that was shot dead to protect a child who’d fallen into the enclosure at Cincinatti Zoo in 2016. Opening with this well-known story, Gray introduces several, real-life ‘wicked problems’ (my favourite part of the book! ), asking us to consider what we would do were we a zoo. Now armed with a sufficient understanding of zoos, ethics, and animal welfare, you get to choose the outcome. Suffice to say, these wicked problems provide a genuinely great kick-starter for opening dialogue at a dinner party. Ultimately, the purpose of this section of the book is to experience the process well-run zoos undertake and the raft of possible consequences they must consider. 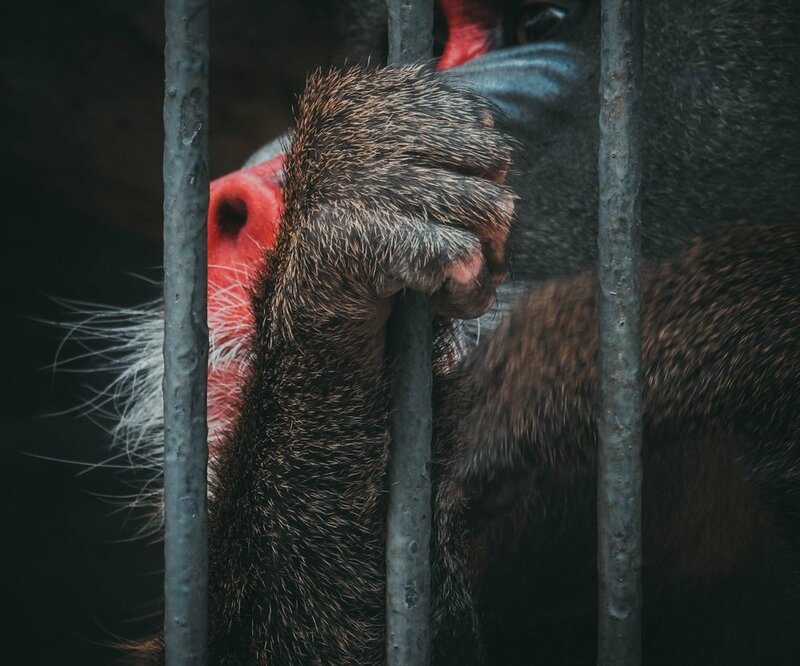 No longer heartless menageries, zoos must balance the weight of outcomes for the animals in question and ourselves. Ask yourself, what would you do? My only criticism of the book is that although aquariums are initially included in the strict definition of a zoo, aquatic examples are limited in their reference. In later parts of the book, I felt as though the concept of aquarium was divorced from that of a zoo. Many examples of animal treatment in the book are limited to ‘terrestrial’ zoos and although not dismissive of aquatic examples entirely, often the focus is on marine mammals (i.e. whales and dolphins). Being a marine biologist, I feel that this minor issue with the book is reflective of our relatively limited understanding of marine life (particularly fish) and our comparative distance in affections for them – for many, fish lack the cute and cuddly factor. Personally, I would have liked to see a little more focus on animal welfare in the context of aquariums, but this by no means detracts from the great value and insight the book provides. Gray is undoubtedly a leader in conservation, in both its theoretical and practical application. The book makes a strong case for rebranding zoos as ‘arks’, a place of refuge and an important tool in aiding conservation efforts. As I read the book, I not only became increasingly appreciative of ‘compassionate conservation’ and how such treatment aids the wellbeing of an animal, but importantly, I found myself reflecting on my own actions towards those I care for, human and animal alike, inside and outside the zoo. You can purchase your copy of Zoo Ethics from CSIRO Publishing. Banner image by Ian McGrory, unsplash.com.